Once upon a time there was a sailor who had no fingers, but he did have the audacity to sail across the Atlantic Ocean single-handed. It was a fingers-optional voyage. When he arrived at the other side, people didn't believe he did it. In fact, they said it couldn't be done. To sail a boat with two arms and legs, and ten fingers and toes is hard enough in the best of times. But to them, sailing across an ocean with no fingers was more than improbable. It was impossible. After all, how could he pull on the halyards to raise the sails, and how could he pull on the sheets to trim the sails. The naysayers and disbelievers were wrong once again, because sailing across oceans isn't about fingers. It's about how you run your mind. Where there's a will, there's a way, and a fingers optional voyage on the seven seas simply means you have to be a little more clever in the way you run your yacht. More often than not, the improbable and impossible can't stand up in the face of a man who wants to make his dreams come true. People are doing the improbable and seemingly impossible all the time, and the naysayers and disbelievers haven't gone away either. While we were sailing transatlantic in December 2005, there were competitors in rowboats making the same voyage under paddle power. You know, row, row, row your boat, gently across the Gulf Stream, merrily, merrily, merrily, merrily, life is but a dream. The statement, "Where there is a will, there is a way," isn't just positive thinking drivel. It's the truth for thousands of people who make their dreams come true. A dedicated rower putting his all into it can beat sailors across a windless sea. The improbable and the impossible strike again and again. Don't forget about Tristan Jones, the man who sailed without legs. He didn't start out that way. When he was in his fifties, he had blocked blood vessels in one of his legs that resulted in an above the knee amputation. Tristan was a life-long sailor in monohull sailboats, and he found it difficult to sail on the seven seas with only one leg because balance was a problem when the sailboat heeled over. The solution to this dilemma was obvious. Trade in his tipsy monohull sailboat for a stable sailing platform - a trimaran. That's exactly what he did. He purchased an old trimaran in California and proceeded to sail it around the world to Thailand. He named his trimaran Outward Leg. Most people would give up sailing if they were sixty years old and had only one leg, but not Tristan Jones. He sailed the waters of Thailand for several years before disaster struck again. He had a blood clot in his other leg, and it had to be amputated above the knee as well. Now he was a sailor who didn't have a leg to stand on. Undaunted, he sold his trimaran and purchased a flush deck catamaran. He scooted around the deck of his yacht using a skateboard. Getting on and off his floating home was a challenge. He rigged a small crane using a whisker pole, and friends used this contraption to transport him on and off the boat in a cage of his own design. He continued to sail the waters of Thailand until he died several years later. Good on you Tristan. You showed us that legs are optional if you really want to sail the seven seas. When we started our transatlantic voyage, we met a yacht crewed by British ex-servicemen, and every member of the crew had lost a limb. They had one normal leg, and one prosthesis to use for walking around on deck. 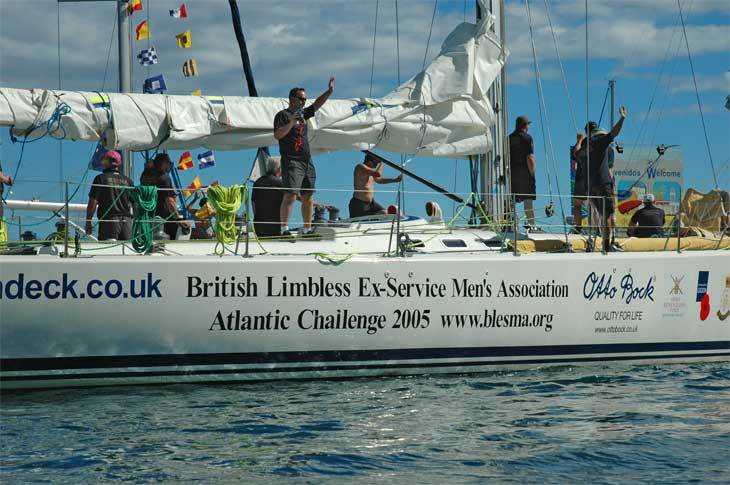 They were sailing in the British Limbless Ex-service Men's Association Atlantic Challenge 2005. Their web site is www/blesma.org. These former soldiers moved confidently on the deck of their large yacht as they sailed out of Palmas Harbor in the Canary Islands. They would remain at sea for two to three weeks to complete the transatlantic challenge. Fingers optional and legs optional sailing are good examples of what people can do when they follow their dreams. It's nice to have fingers and legs, especially when you are sailing on a yacht around the world. But, never forget it's not fingers and legs that make your dreams come true. It's the way you run your mind. When you follow your dreams and ignore the skeptics, the improbable and seemingly impossible frequently do happen. So there you have it. You must live as if your dreams are possible and work each day to make them happen. Someday we may even see some of you out here sailing on the ocean of your dreams.